You wouldn’t think that a place that’s only 9 degrees could make you feel so warm. But it does! Every year! 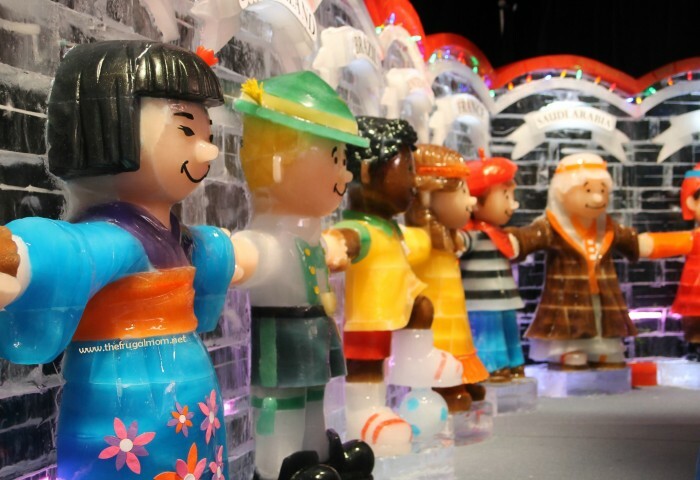 This year’s theme at the Gaylord National Resort & Conference Center’s annual ICE! show is Christmas around the World. It’s sort of like the It’s a Small World ride at Disney World, sans boats and warm temperatures. For those of you who have never taken in the annual ICE! 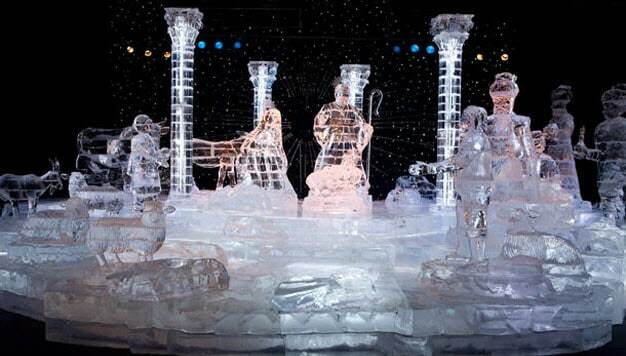 spectacle, what you have been missing is 2 million pounds of ice carved into an amazing array of colorful, holiday-specific shapes. Past years have featured carvings and sculptures depicting the Grinch Who Stole Christmas, Frosty the Snowman, Santa Claus is Comin’ to Town, and — somewhat inexplicably — Madagascar. Once you’re in the front door, you’re greeted by an array of carved Christmas ornaments, each emblazoned with a flag from a different country. Next is a photo op spot — a big globe adorned with a red banner across the front and dozens of country flags on top. The first room has character carvings of Dutch, Mexican and Ethiopian children, as well as the obligatory Santa, accompanied by Rudolph. A big part of the fun every year is taking a turn on the two-story ice slides. I like to take several turns, and this year I could, because I ended up going on a day that wasn’t too crowded. In previous years, you could be stuck waiting for a while, which is probably what prompted a grown woman to attempt push ahead of my son one year, who was about 9 at the time. (He wouldn’t let her. They tussled all the way up the stairs. It gave the rest of us something to do while we waited.) Plus, they have more slides now than they used to. Another room featured a Christmas tree surrounded with real toys, and next to each one, its ice-carved counterpart. Favorites included a dinosaur, wagon and giraffe. The last room always features a Nativity scene with no color added — just clear and white ice. I have never had any trouble getting in to the ICE! show over the years, but beware, stories abound of waits of up to three hours. Plenty of naysayers online decry the experience as overrated and overpriced. It’s true that it’s not cheap, and you don’t spend much longer than 20 minutes inside, so you may not think it’s worth it. During peak hours, ticket prices for two adults and two children ages 4 to 11 comes to $152. Parking at the hotel garage was $16 for two hours ($28 for four hours or longer), so I parked at a garage two blocks away and paid $6. Making a day out of it is fun, but it will cost you even more. Among other available activities are: train, carousel or teacup rides ($5 each); gingerbread house decorating ($30-$40 each); Elf on the Shelf Scavenger Hunt ($10 each); breakfast with Charlie Brown and friends (this is weird, because it’s the featured theme at Gaylord Orlando, not here, $27 per child, $40 per adult); and Cookies with Mrs. Claus ($20 per child plus $5 per accompanying adult). Some combo tickets are available and might help save you a few bucks. Also keep in mind that steeping yourself in Gaylord’s stunning lobby decorations is free, as is the fountain and laser light show held nightly, which is accompanied by a “snowfall” (soap bubbles, but still delightful and realistic-looking, especially to young children). If you’ve never seen this stunning extravaganza, you should definitely plunk down your $40 and give it a try. And if you find that you love the magical experience and marvel at the carvers’ craftsmanship and the sheer magnitude of the display, go every year, like I do! Open daily through Jan. 1, except Dec. 5-7. Tickets prices range between $17 and $36, plus tax and a $2 service charge per ticket.